Explore the wildlife & scenery of the eastern Himalayas & West Bengal. Visit Kaziranga National Park on the Brahmaputra River where you can see wild Asian elephants & one-horned rhino. Continue to the tea-producing hill country of Darjeeling & Mother Teresa Mission in Calcutta, before taking a boat to the Sundarbans Delta. English speaking city guides, private driver, jeep safaris & sightseeing included. You will be met at Calcutta Airport and transferred to your hotel in this bustling city - the third largest in India and the capital of West Bengal. Now known as Kolkata, this city was originally developed by the British East India Company and became the capital of the British Empire in India until 1911, when the capital was relocated to Delhi. Today enjoy a full day tour of Calcutta, a city of palaces situated on the east bank of the River Hooghly and the principal commercial, cultural and educational centre in eastern India. Calcutta is also noted for its revolutionary history, ranging from the Indian struggle for independence to the leftist Naxalite and trade-union movements. There are many interesting sites in this city and you can discuss your preferences with your guide. We usually start our day with a visit to the Mother Teresa Mission, which works amongst one of the poorest communities in the world (closed on Thursdays & public holidays). We then drive past BBD Bagh Garden (formerley Dalhousie Square), named after three freedom fighters and now the office hub of the city. The impressive colonial buildings here date back to when this city was the capital of British India. You can see Raj Bhavan (Government House), St John's Church, the High Court, Post Office, Town Hall and beautiful Writers Building. You can also see the Flower Market and drive across the impressive Vidyasagar Setu Bridge. Other places of interest include St. Paul’s Cathedral, Victoria Memorial (closed Mondays), Indian Museum (closed Mondays) and Marble Palace. In the afternoon enjoy a boat ride on the Hooghly River that links Calcutta with Howrah and enjoy a visit to the beautiful Dakshineswar Kali Temple. Our last stop is at the Jain Temple and the traditional potters quarters in Kumartuli in northern Kolkata. Transfer to Calcutta Airport for your flight to Bagdogra, where you will be met and transferred 3-hours to Darjeeling. Situated in the lesser Himalayas at an altidude of 6,710 ft (2,050 m), this town was the summer capital of British India when it was governed from Calcutta, due to its pleasant climate. Today it is famous for its distinctive black tea and the Darjeeling Himalayan Railway. Darjeeling is also well known for its cultural diversity, as it is home to many Tibetan refugees and descendants from Nepali and Bihari labourers brought to work here on the tea plantations. Rise early today to visit Tiger Hill and experience the sun rising over the peaks of the Himalayas. After returning to your hotel for breakfast, transfer to the station to board the Darjeeling Himalayan Railway, one of India's five famous Toy Trains built by the British to access the hill stations. The train travels to Ghoom, where you will disembark and visit the Ghoom Monastery that follows the Gelug school of Tibetan Buddhism. Here the monks fly prayer flags in the Tibetan tradition and there is a 15-ft statue of Maitreya Buddha (the Coming Buddha). It is the largest of the three monasteries in Ghoom. Afterwards we visit the Tibetan Refugee Centre, established as a self-help scheme for Tibetans who trekked across the Himalayas following the dramatic escape of the Dalai Lama, when China invaded Tibet (closed on Sundays). We then visit a Tea Plantation, before returning by road to Darjeeling. Note: Tea plucking & processing is closed from November to March, when we will visit the gardens only. Today drive 4-hours to Gangtok in the eastern Himalayas, the capital of the state of Sikkim and a centre of Tibetan Buddhist culture and learning. In the afternoon relax in this city that is wreathed in clouds. This morning we visit the beautiful Rumtek Monastery, with its intricately painted exterior and priceless Buddhist manuscripts. We then explore the Namgyal Institute of Tibetology, a centre for Mahayana Buddhism with rare statues and embroidered scrolls charting the intertwined Buddhist cultures and histories of Sikkim and Tibet. Here we can learn more about their religion, history, language, arts and culture (closed Sundays). You can view the impressive Do-Drul-Chorten, an imposing stupa (shrine) ringed by prayer wheels, and visit cottage industries making traditional handcrafts. You can support the local people by buying some of their wares. We also visit Srama Gardens, a sanctuary with a collection of over 454 species of orchids. Transfer 5-hours to Bagdogra Airport for your flight to Guwahati. You will be met at Guwahati Airport and transferred to your hotel. Time permitting, along the way we will visit Kamakhya Temple - famous for its religious and archeological heritage. This morning your driver will take you to Nabagraha, an ancient center of astrological and astronomical research. The temple is enshrined with nine Shiva Lingam (symbols of the Hindu god Shiva), representing the nine planets, with one in the centre symbolising the sun. We then board a country boat across the Brahmaputra River to visit the Umananda Temple on Peacock Island – a Shiva shrine built by an Ahom king in 1594. We also visit Kamakhya Temple, a famous Hindu pilgrimage site. Afterwards we leave Guwahati and travel 5-hours to the moist deciduous forests of Kaziranga National Park in the foothills of the eastern Himalaya Mountains. 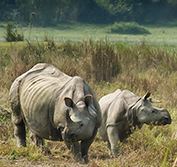 Kaziranga is a biodiversity hotspot situated on the southern banks of the mighty Brahmaputra River and is home to two thirds of the world's remaining population of severely endangered one horned rhinos, as well as wonderful bird life. Check into your lodge situated near the entrance to the park. On your first morning, enter Kaziranga National Park riding on the back of an elephant. After enjoying a packed lunch, continue your game viewing on a shared jeep safari. This wildlife reserve, which covers an area of over 145 sq.miles (380 sq.km), is particularly rewarding, as it combines high species diversity with good visibility across the expanses of tall elephant grass, marshland and tropical broadleaf forests that are criss-crossed by four major rivers. In addition to its rare one-horned rhino, the park is also home to large breeding populations of Asian elephants, wild water buffalo and swamp deer. This park has one of the highest density of tigers in India, but sightings in the wild are rare due to the dense vegetation. The beautiful flora and fauna add to the scenic beauty of this park, which is also a very important birding habitat. Two shared jeep safaris per day are included, in addition to one elephant back safari during your stay. Alternatively you can substitute your morning jeep safari for a 2.5-hour jungle trek with a naturalist, to enjoy the outstanding bird life. Note: This tiger reserve is closed during the Holi & Diwali festivals, as well as during the monsoon season (June to October). Transfer 1-hour to Jorhat Airport for your flight to Calcutta, where you will be met and transferred to your hotel in this bustling city. This morning transfer 2-hours from Calcutta, travelling through rural countryside. Around midday arive at Gothkhali Jetty, from where you will be transferred 3-hours by small boat to your lodge in Sundarbans National Park. The mighty Ganges, Brahmaputra and Meghna Rivers convergence into the enormous Sundarbans Delta, before flowing into the Bay of Bengal. Sundarbans National Park covers an area of over 10,000 sq km, with over half of the park located in neighbouring Bangladesh. After checking into your lodge and enjoying lunch, glide through the creeks and dense mangrove forests of this national park that is a UNESCO World Heritage site and also a tiger reserve. You can disembark and climb a watchtower to observe the birds of the treetop canopy, before returning to your lodge at sunset. In the evening experience traditional Adibasi tribal dancing around a campfire. Wake to the sound of birdlife and set out early, before the heat of the day, to explore the many waterways of Sundarbans National Park. Intersected by a network of tidal waterways, mudflats and small islands of salt-tolerant mangroves, the Sundarbans Delta is home to over 260 different bird species, as well as Royal Bengal tigers and other threatened species - including the large estuarine crocodile and Indian python. Activities vary by lodge, but usually include exploring these creeks and dense forests by small boat. You can climb up a watchtower for views over the delta and visit a spotted deer rehabilitation centre. In the afternoon you can experience the local Sunderbans lifestyle, as you visit a local village to learn more about their crafts, lifestyle and local food - and how man and tiger co-exist in such difficult terrain. Observe their farming methods and their houses, which are constructed from mud and have very small entrances. One day you can venture further afield to visit the 300-year old temple to Bon Bibi, the forest goddess to whom village fishermen and honey-collectors of every caste pray for safety from tigers and crocodiles. Today transfer 2-hours by boat from the Sundarbans Delta (with breakfast on board) and 3-hours by road to Calcutta. Check into your hotel and relax, with balance of day at leisure. Transfer to Calcutta Airport for your flight home.